Welcome back. 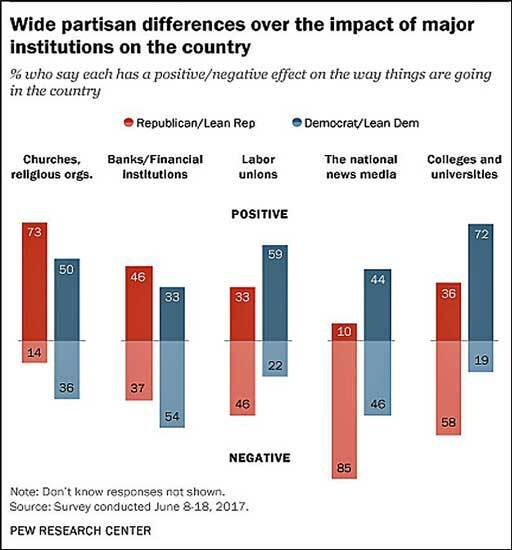 After speaking with a handful of people about the partisan divide a recent Pew survey highlighted in America’s view of national institutions, I decided to blog about the topic. Of my handful, only one had any awareness of the survey--he brought up the topic to me--and his awareness was limited. Word of the survey was probably drowned out by all the other political partisanship flowing from Washington. So, here’s the story. Regrettably, it’s not very pretty. The Pew Research Center conducted telephone interviews in June with 2504 adults across the US. The goal was to gauge peoples’ opinions of the effect that colleges and universities, national news media, churches and religious organizations, banks and financial institutions and labor unions have on the way things are going in the county. Along with the overall responses, the survey tallied Republican and Republican-leaning independents separately from Democrats and Democrat-leaning independents. Although factors such as age, ideology (liberal, moderate, conservative), educational attainment and family income were collected and their effect on results sometimes reported, I’ll only comment on differences associated with political party. I’m an Independent, yet I’ll keep the text simple by just referring to Democrats and Republicans, omitting the Democrat and Republican leaners. Don’t forget they’re included. Pew survey of Americans' views of national institutions. Twice as many Democrats as Republicans, 72% versus 36%, think colleges and universities have a positive effect on the way things are going in the country. The Republicans’ opinion has become increasing negative over a short term. Two years ago, 54% of Republicans thought colleges and universities had a positive impact, last year it was 45%. What’s happened to Republicans? Is it because of the protests against conservative speakers at a few universities? The liberal or elite label given to academia by talk radio and the like? If it were the cost of attending college or what’s being taught when finding jobs has center stage, wouldn’t Democrats also react? When so many people get their news from the internet (and social media), I’m not certain what telephone survey respondents associate with the term “national news media.” Nevertheless, the survey found only 10% of Republicans have a positive view of the news media compared with 44% of Democrats. Can you imagine being employed in the news media (or the Intelligence Community), facing the president’s constant barrage, no matter how unwarranted the criticism? But it’s not really new for Republicans. They have been very negative about the national news media for years, well, at least through Obama’s presidency. Republicans, at 73%, feel churches and religious organizations have a positive impact on the country, while Democrats, at 50%, are marginal in their view. Although the Republicans’ view of banks and financial institutions is not overly positive at 46%, it is more positive than that of Democrats, at 33%, and it has more than doubled since the Great Recession. Sticking with tradition, most Democrats think labor unions have a positive effect on the county (59%); Republicans do not (33%). Have they ever? During the presidential campaign, I blogged about the national opinion poll commissioned by ScienceDebate.org and Research!America (Voters Endorse Science, Voters Endorse Science Addendum). How heartening it was to see Republicans, Democrats as well as Independents all in agreement, all strongly endorsing science and the view that candidates for President and Congress should have a basic understanding of the science informing public policy issues. I guess the public’s unanimity was an anomaly. Anyway, it had no effect on the presidential election. Thanks for stopping by.